Reality TV star Jade Goody has died at the age of 27. She died at home with her family in Upshire, Essex, in the early hours of Sunday after a high-profile battle with cervical cancer. Her mother Jackiey Budden, who was at her side as she died, said: "My beautiful daughter is at peace." Prime Minister Gordon Brown said he was "deeply saddened" by the news and described Goody as "a courageous woman both in life and death". "The whole country has admired her determination to provide a bright future for her children. "She will be remembered fondly by all who knew her and her family can be extremely proud of the work she has done to raise awareness of cervical cancer, which will benefit thousands of women across the UK." 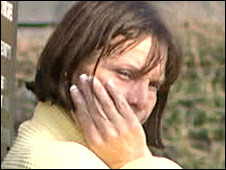 Goody shot to fame after being a contestant in the third series of Big Brother in 2002 and was taking part in a version of the show in India last year when she was told of her illness. The disease spread to her liver, groin and bowel and she was told it was terminal in February. The star had been treated at the Royal Marsden Hospital in west London but wanted "to spend all the time she had got left" with new husband Jack Tweed and sons, Bobby, five, and Freddy, four. Goody died at home at 0314 GMT on Mother's Day. Her body was taken out of her home shortly before 0800 GMT. Speaking outside the home, Ms Budden said: "Family and friends would like privacy at last." Mourners started arriving at the house to pay tribute to Goody within minutes of the news breaking. Jackie Marron, who was among those leaving floral tributes at the gates, described Goody's work to highlight the risks of cancer as an "inspiration". "The way she's done her things is absolutely fantastic... her courage, her guts," she added. Kim Luther, who sold Goody her home, remembered her fondly as "the girl next door, the normal girl". Laying a bunch of flowers, she said: "She's our our Essex princess. And she will be remembered like that. She's shown awareness. She's shown that you know it can happen to absolutely anyone, this awful illness. " The star had been christened in a 20-minute ceremony at the Royal Marsden on 7 March while in a wheelchair and was assisted by nurses during the service. Goody's illness had featured in the media on a daily basis over recent weeks. 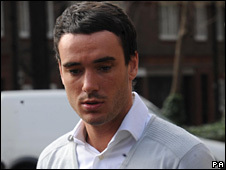 She married partner Jack Tweed on 22 February at Down Hall Country House Hotel in Essex. OK! magazine paid a reported £700,000 to cover the event. Goody stipulated that the entire amount should be passed on to her sons. The wedding was also filmed as part of a documentary series following the star and was screened on digital channel Living. Goody, originally a dental nurse from Bermondsey, south London, was initially famous for showing poor general knowledge on Big Brother. She was later accused of being racist towards Bollywood actress Shilpa Shetty during a celebrity version of the show. However, public opinion softened when the star became ill. In a statement from Mumbai, Shetty said: "I am deeply saddened but I am glad Jade is out of pain and that she died peacefully with her family around her." Goody was open about wanting to exploit media interest in her battle with cancer to raise public awareness of the disease and prevent other women from suffering her fate. Her publicist Max Clifford said: "I think she's going to be remembered as a young girl who has, and who will, save an awful lot of lives. "She was a very, very brave girl and she faced her death in the way she faced her whole life - full on, with a lot of courage." Cancer Research UK chief executive Harpal Kumar said: "Her brave battle with an aggressive form of cervical cancer has received widespread public attention and encouraged thousands of women to seek advice on how to prevent the disease. "She has done a great public service by raising awareness of the importance of screening during her last few months of life." Phil Gould, associate editor of OK magazine, said: "Most women that I know who are in their 20s have now gone for smear tests or are trying to get smear tests because of what's happened to Jade." Even in death the cameras will remain firmly fixed on Goody as preparations are made for her funeral. "She wants it to be a big celebration because it's her final farewell to everybody," Mr Clifford said. Describing the funeral as a "Jade Goody Production", he said the funeral cortege would process through Loughton - near her home in Upshire, Essex - after church service. No date for the service has yet been set. Mr Clifford said Goody's children had known their mother was seriously ill.
"She sat down and explained that Mummy was going to heaven and that heaven is where people who are ill go to get better," he said. "She said when they look in the sky and see a star, that's Mummy looking down." He added that he hoped Goody's family would be left in peace to grieve. TV presenter Jeff Brazier, the father of Goody's two sons, said he was "devastated" at Jade's death. "I'm grateful the boys were able to say their goodbyes and spend that precious time with their wonderful mother," he said. "Bobby and Freddie are my absolute priority and I will be doing everything I can to be their rock and to give them all my love and support to get them through a confusing and upsetting time." What is Jade Goody's legacy?